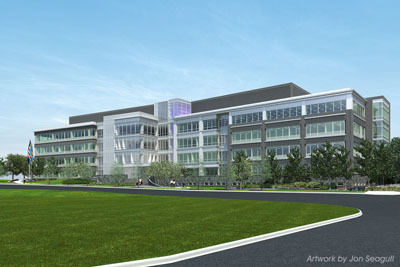 FAIRFAX, Va. – Fairfax County Board of Supervisors in Virginia has awarded Manhattan Construction Co. the contract to build a new office building and parking garage at 8221 Willow Oaks Corporate Drive in Fairfax, Virginia. The contract is approximately $48.5 million and includes construction of a five-story, 200,000-square-foot building and a 230,000-square-foot parking garage. The project is managed by the Fairfax County Department of Public Works and Environmental Services. “Fairfax residents can expect to see Manhattan crews starting foundation work for this project this week,” said Manhattan Senior Vice President Jim Lee. This is the second project Manhattan has contracted with the County to build, said Lee. Manhattan completed the McConnell Public Safety and Transportation Operations Center and Forensics Facility in 2008 for which the company was honored as Contractor of the Year by the American Public Works Association – Virginia/DC/Maryland Chapter. When complete, Fairfax’s new building will house behavioral healthcare services of the Fairfax-Falls Church Community Services Board, including 24/7 emergency services. Designed by Noritake Associates of Alexandria Virginia, the project is LEED®-registered, seeking LEED Silver certification. LEED, or Leadership in Energy and Environmental Design, is the U.S. Green Building Council’s internationally-recognized green building certification system. The exterior of the building and garage will feature architectural precast concrete, metal panels, punched and ribbon windows, and glazed curtain wall. The base of the building will be clad in natural stone. The 712-space cast-in-place parking garage includes a “Limelight” lighting control system designed to provide a 65 percent reduction in energy costs when compared to regular systems. The system includes motion sensors and instant notification of any light‐out scenario through e-mail or pda messages. Landscaping and hardscaping for the development includes extensive retaining walls, green screens and an entrance with a large pergola. Lee anticipates the project will be completed in the summer of 2014. Founded in 1896, Manhattan Construction is recognized by Engineering News-Record among the top 20 general builders in the nation. Manhattan operates from offices in Tulsa and Oklahoma City, Okla.; Dallas and Houston, Texas; Naples, Fort Myers, Sarasota, Kissimmee, Fla.; Washington, D.C.; and Atlanta, Ga. Manhattan’s building portfolio includes corporate headquarters, institutional, healthcare, office, hospitality and leisure, sports and entertainment, aviation, retail, and judicial facilities throughout the United States, Mexico, Central America and the Caribbean. For more information visit: www.manhattanconstruction.com. You are currently browsing the Manhattan Construction Group blog archives for September, 2012.